If you're in need of some fun Christmas party games you've come to the right place. We have tons of interactive icebreakers and games for the holiday season. Planning a family get-together or hosting a holiday party over the Christmas season? Then, you'll need activities that everyone can participate in. Start a new Christmas tradition with these family Christmas ideas or unique advent ideas. For an easy icebreaker try our Ring a Bell Christmas game or to make gift giving even more fun, there are several Christmas gift exchange games to choose from. Challenge your guests' knowledge of Christmas with some fun Christmas trivia or go all out and host a Christmas murder mystery party. Hosting a church Christmas party? Consider a Christmas right left nativity story game. Our party MC of choice always adds hilarity to the right left Christmas games by throwing in an ad-lib or two, or however many it takes to get the participants in stitches. 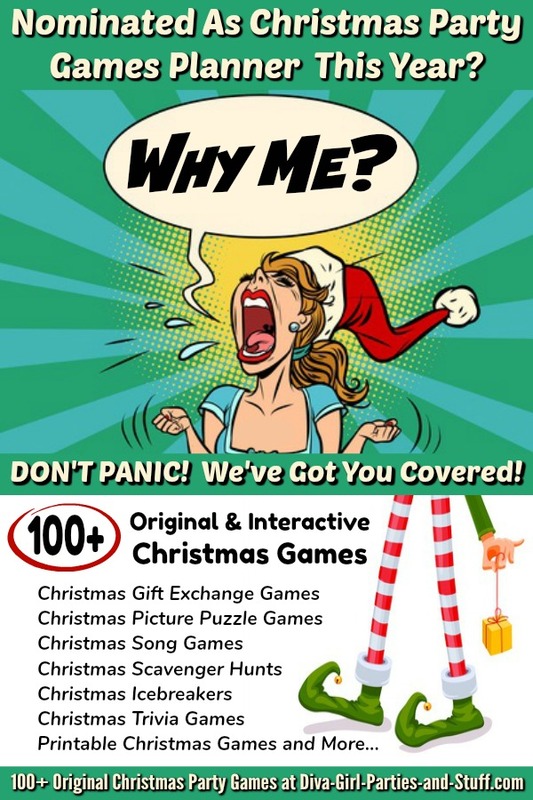 You might even want to try a round or two of Christmas Family Feud or any one of the many other interactive Christmas party games listed below to get all of your guests involved in the fun. 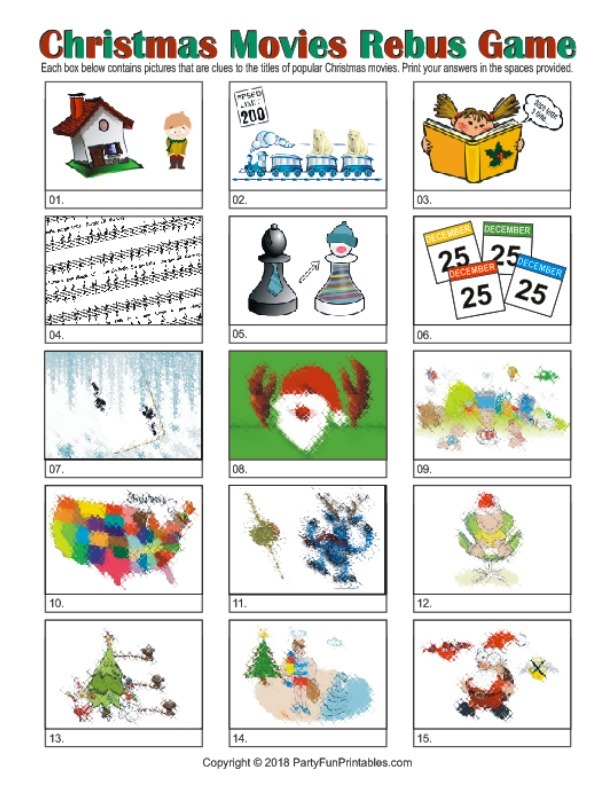 Christmas Song Picture Game - Guess the popular Christmas songs from their image hints. Includes a printable version for immediate download. Example: What Christmas carol comes to mind when you see a manger being carried up into the sky by a hot air balloon? Name That Carol - Have you ever found yourself trying to remember the title of a familiar song? You try and try, but your memory fails you over and over again. Name that carol is based on that frustration.Guess the title of well-known Christmas carols with only three or four words from the song. 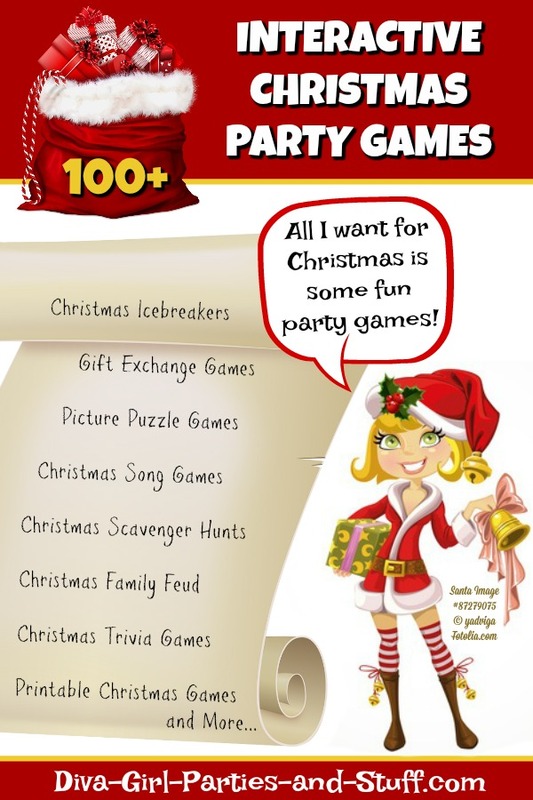 You can find the list and instructions on our Name That Carol party game page. Example: What Christmas carol does contains the phrase "cold winter's night"? 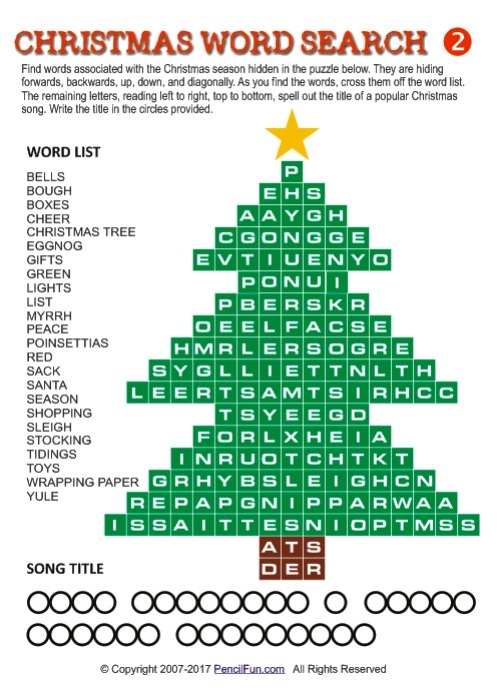 Synonymous Christmas Carol Game- How well do you know your Christmas carols? 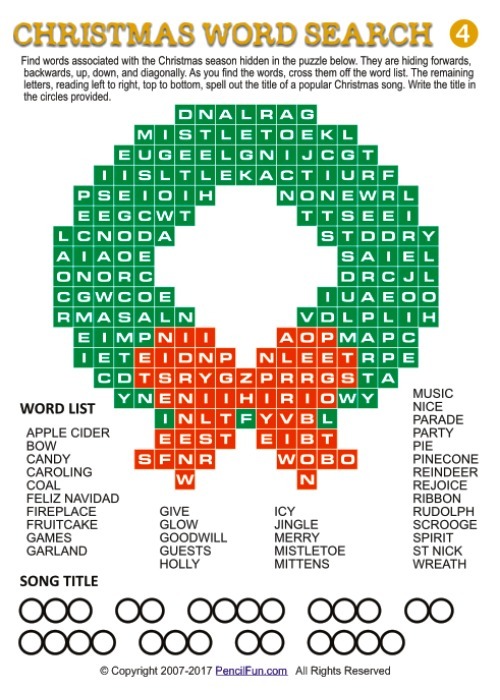 Find out with this crazy title altering Christmas carol game. You may find you don't remember Christmas carol titles as well as you thought. Example: What Christmas song title is synonymous with "Sprightly venerable benefactor"? Can you guess? 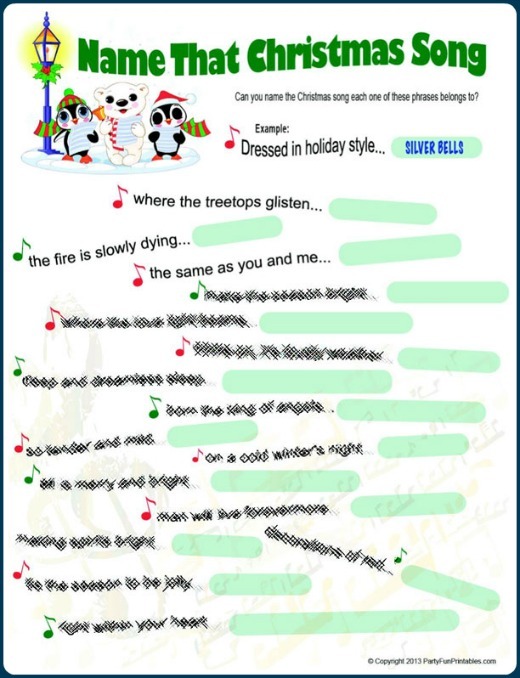 Name that Tune - Check out these online lyrics and instrumentals for popular Christmas songs and carols at Santa's Sing-A-Long Christmas Carols or Instrumental Christmas Carols and Lyrics. 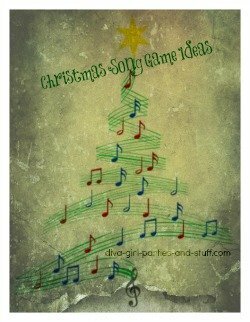 If your computer is within earshot of your main party area you can use the instrumentals to play Name That Tune type Christmas party games. There is a great selection to choose from. 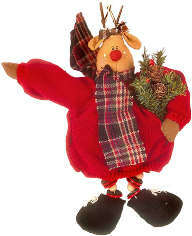 Christmas Auction - Make gift giving especially fun this year with a Christmas Auction. We have printable Santa bucks and angel dollars available upon request for you to use for your Christmas party games. Just fill in the form below the printables you'd like. 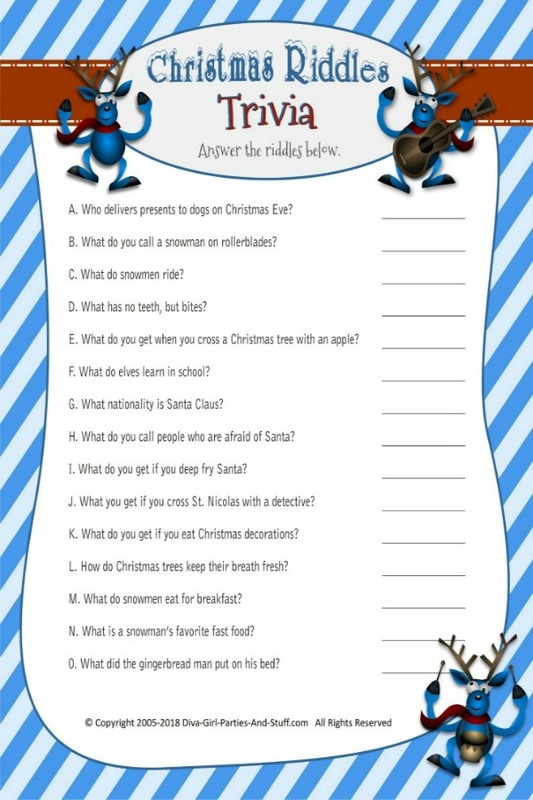 Easy Holiday Icebreaker Game - A fun Christmas party icebreaker that challenges... "Are You Ready for Christmas?" The most prepared guest wins a prize based on the accumulation of xmas-ready points. Example: If you are hosting more than one Christmas party in your home this holiday season, give yourself 5 points. Puzzling Christmas Star - Be the first person or team to assemble this Christmas star puzzle. Do you think you're up for the challenge? You'll be surprised how long it takes your guests to put it together. 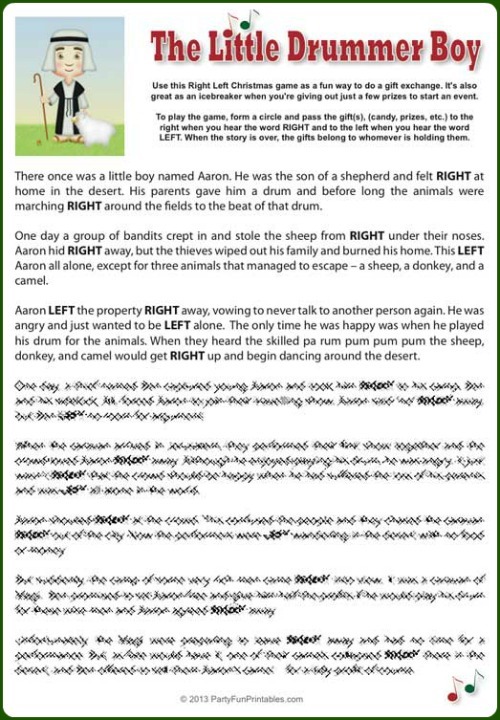 Ring a Bell Christmas Game - Find the guest who matches the most Christmas related scenarios on our list or play for individual points and small prizes. Example: I am looking for the person who owns the most Christmas movies. Christmas Riddles Trivia Game - 15 punny holiday riddles with answers. 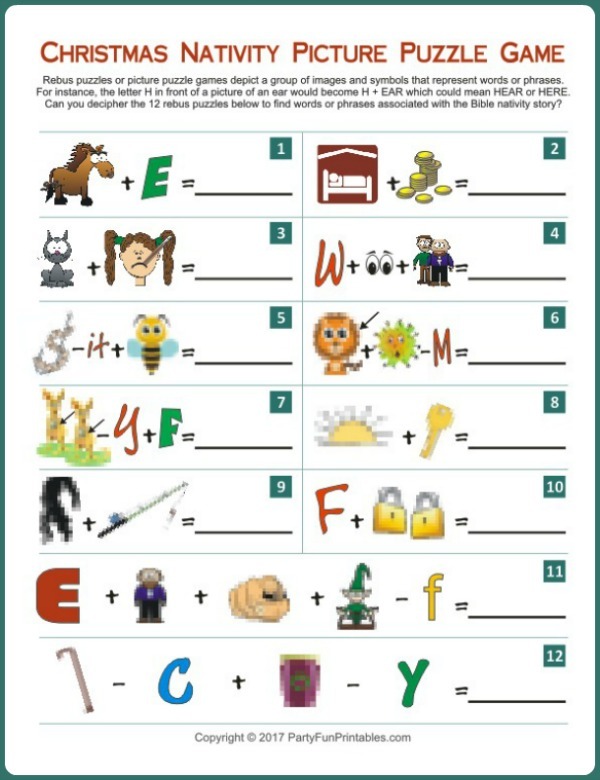 The printable download includes a version with an answer box (with the answers mixed up on the page) and one without. What is a snowman's favorite fast food? Name That Christmas Movie Game - Guess popular Christmas movies from their new altered titles. If you can name all of these Christmas movies you're a devout Christmas movie connoisseur... no doubt about it! Example: What Christmas movie title is "vivacious bulbous spheroids of chilled precipitate" synonymous with? 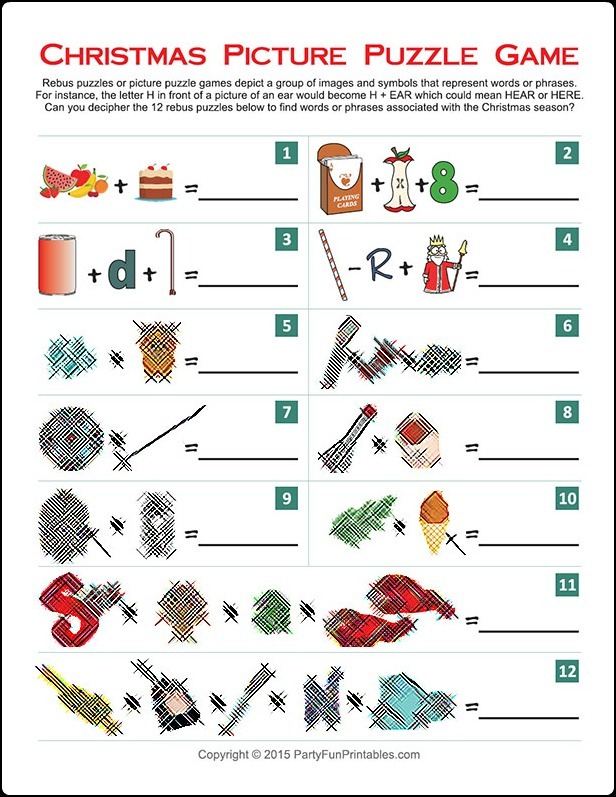 Christmas Trivia Quiz - 20 multiple choice trivia questions based on a variety of Christmas related topics. Example: What was the angel's name in "It's a Wonderful Life"? 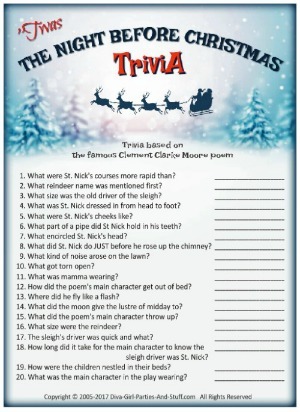 The Night Before Christmas Trivia - 20 questions that will seriously challenge your memory of the classic Christmas poem. 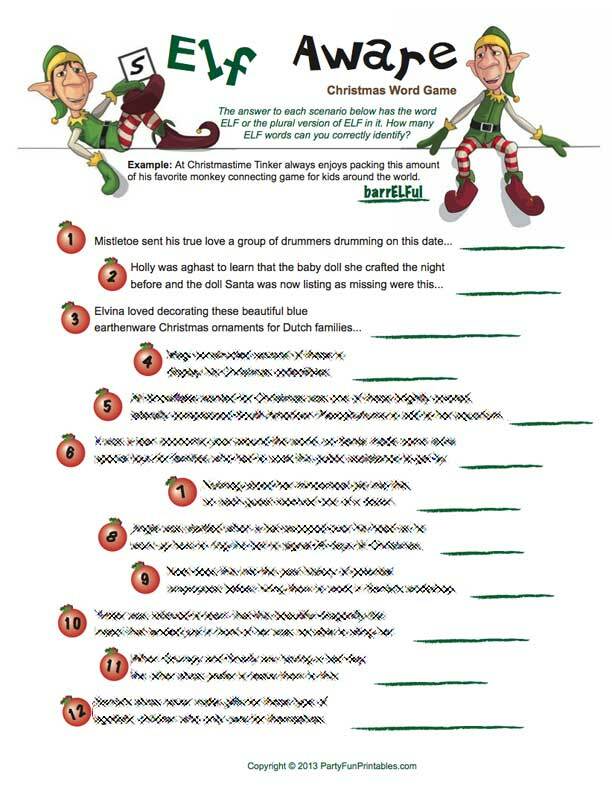 Examples: What reindeer's name was mentioned first in the poem? What were St. Nick's cheeks like? Match the 12 days of Christmas gifts up with their symbolic Christian meanings. Example: Ten Lords-A-Leaping represents the 10 Commandments found in Exodus 20 in the Bible. Crazy Christmas Scavenger Hunt - Have your guests hunt for odd, out-of-place, crazy Christmas items that you've planted around the room prior to their arrival. Includes a list of ideas and instructions. Christmas Video Scavenger Hunt - Teams compete to capture a list of Christmas related scenarios on video, while enlisting the help of kind and willing strangers. To view this printable page, you will need Adobe Reader installed on your computer (the latest version is recommended). You can get your free Adobe Reader here (a new window will open so you can download without leaving this page). Note: If for any reason you cannot download this page or any other printable page on this site, contact us and we will send you a copy via email. 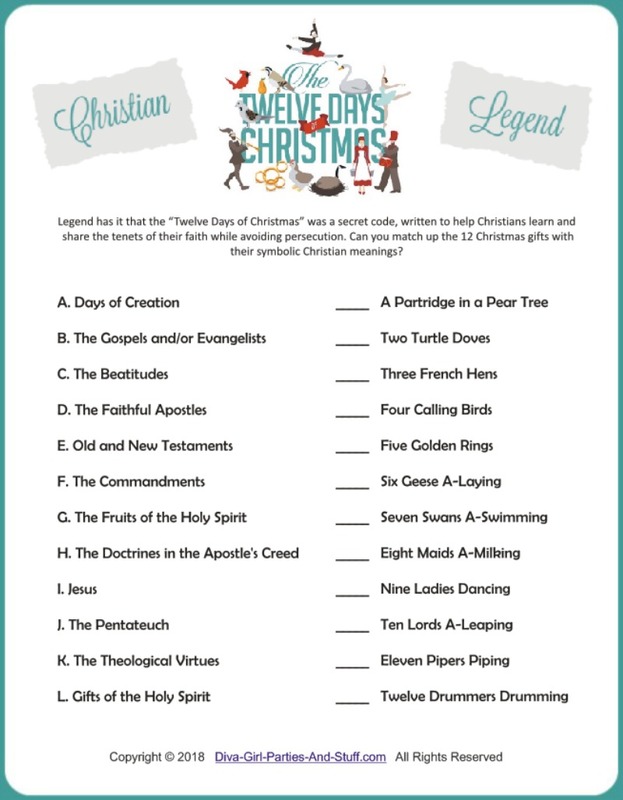 Church Christmas Scavenger Hunt Ideas - 5 different ideas for hosting a Christmas scavenger hunt at church. Office Christmas Scavenger Hunts - 4 ideas for hosting a Christmas scavenger hunt at the office or with staff. IMPORTANT: Our resource for this game recently closed shop. If you are interested in an alternative, let us know HERE! Be sure to note the type of game you're looking for and this page. 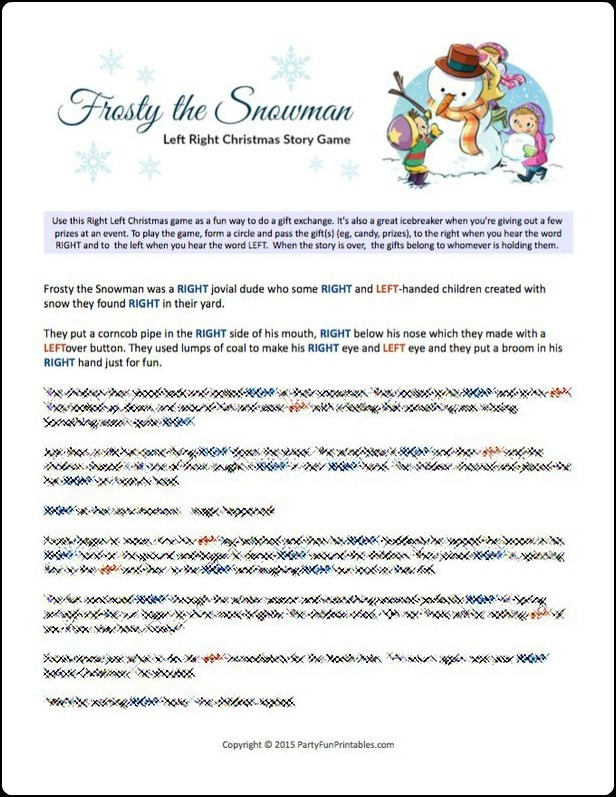 More Christmas Scavenger Hunt Ideas - Ideas ranging from Secret Santa to Good Samaritan hunts. Christmas Clay Creations - This is a Pictionary style game using clay instead of drawing tools. 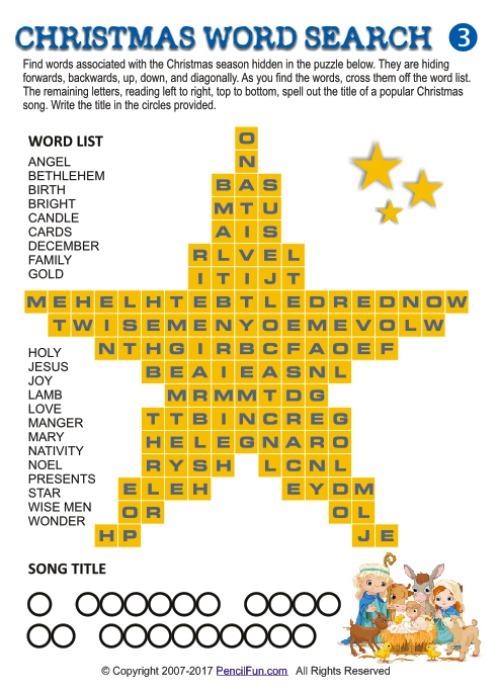 Sculpt clues to help your team guess popular Christmas songs and carols. Experience the fun of using playdough to make your own unique clay creations. For instructions and a list go to our Christmas Clay Creations page. 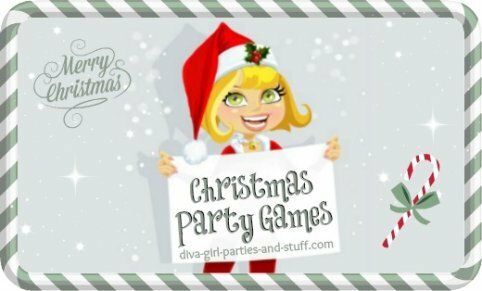 Parlour Games - Make your family Christmas gathering fun and memorable by including some good old-fashioned Christmas parlor games. Christmas Charades - Players divide into two teams. One team member is selected to be the pantomime and randomly draws a slip of paper from a container with a word or phrase on it. The player must then pantomime this word or phrase to her teammates within a set time limit. She must not use any sound or lip movements. The teams alternate until each team member has had an opportunity to pantomime. 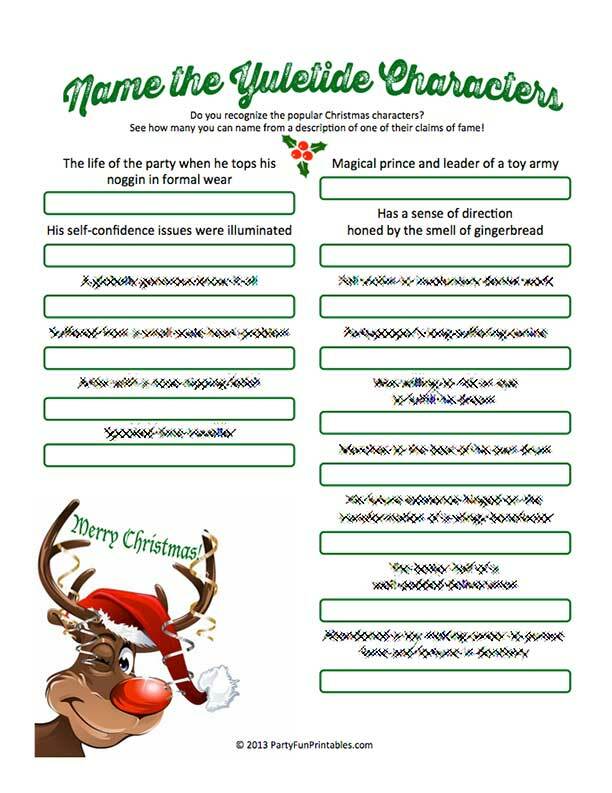 Create a list of Christmas carols or Christmas objects to use for this game or try using our printable Christmas movie titles. 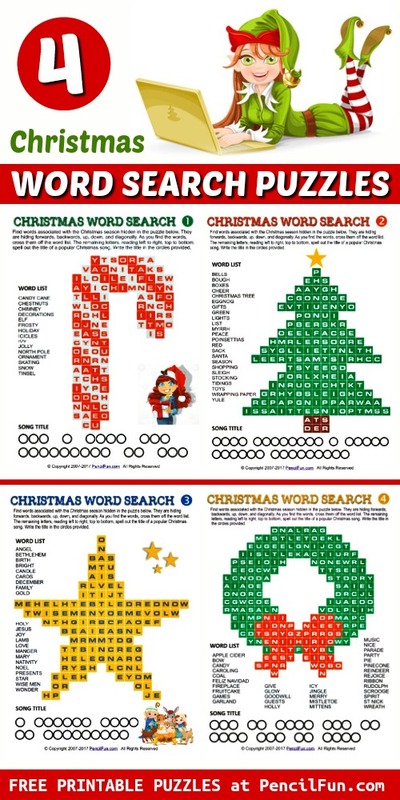 4 Christmas word search puzzles shaped like popular Christmas symbols. 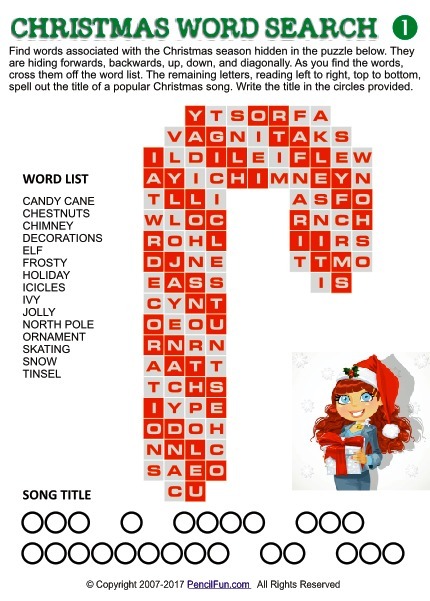 Solve the puzzles to find the titles of Christmas songs. Every party needs yummy treats. For your upcoming party try my favorite recipe for Christmas chocolates. You can even make your own homemade boxes to put them in and give them as gifts or favors.